View the newest Hanalei Bay Villas for sale in Princeville below! The Hanalei Bay Villas for sale are brilliantly located in the fabulous and popular community of Princeville and they’re the perfect retreat to call home while being surrounded by the pure paradise that is this part of Kauai. Much like the beautiful properties found in Kainani Villas and Wailua Homesteads, Hanalei Bay Villas for Sale offer both ocean and mountain views and they’re only a short walk to nearby beaches. Purchasing a Hanalei Bay villa also allows you to enjoy close access to Princeville’s amenities and delectable restaurants. It’s easy to imagine the sand in your toes and waking up to the sound of the ocean every morning. Or perhaps you’d rather picture having your morning coffee overlooking the mountains and the gorgeous waterfalls that famously accompany them. With the beautiful living quarters, breathtaking views, and resort-style amenities, these villas leave nothing to be wanted. Don’t miss an opportunity to invest in Hanalei Bay Villas for sale! Browse our listings below or continue reading about these exquisite properties. 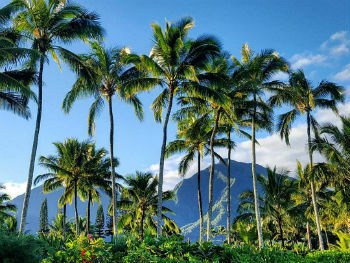 Get Hanalei Bay Real Estate Listings Before Your Competition! If you enjoy majestic views and spacious living, you’ll fall in love with Hanalei Bay Villas for sale. Buyers can expect to enjoy watching sunsets, embrace the cool trade winds, and dine or lounge on their private lanais. Many of these properties have been substantially upgraded with new paint, flooring, kitchens, and bathrooms. Additionally, a lot of the villas are available fully furnished, taking the stress away from moving. Whether you’re interested in investing in a vacation rental or residential living, you’ll be able to find your dream condo here. The Hanalei Bay condos offer a lot of privacy while not compromising the gorgeous Hanalei Bay views. Many of the properties are situated along ocean bluffs with trail access to a hidden beach below. For the adventurers, you can follow the foot trail around the bay to wade across the Hanalei River, making your way to Hanalei Pier and Beach Pavilion. You’ll never run out of activities to keep you busy if you own a Hanalei Bay Villa.. Although the resort itself isn’t a beach or oceanfront property, Hanalei Bay villas and real estate have been known to face the ocean, which provides the perfect evening backdrop as you while away the hours with friends on your private lanai. Although the kitchens in Hanalei Bay’s Villas for sale tend to be on the modest side, the views, the grounds, and the nearby amenities all make up for what could be considered as lacking from the homes for sale in this spectacular part of Princeville. Situated on both a golf course and a resort property, it's easy to see that the Hanalei Bay Villas offer unparalleled amenities. From the Makai Golf Course to the Hanalei Bay Resort, there's always something to do here. Additionally, the ocean is only a few steps away from your villa. What better way to spend a day than a morning at the beach, an afternoon golfing and a delectable dinner at the resort in the evening? Or if you prefer, you can even play tennis or swim in one of the nearby pools. And it doesn't hurt that beautiful Puu Poa is just down the road, as well. Start your Princeville real estate search today! Contact Anne Eliason, Kauai’s real estate professional, and she’ll compile a list of properties that will suit your needs.